Patrick is remembered today as the saint who drove the snakes out of Ireland (there are no serpents in Ireland, to this day) although some who refute the existence of snakes having ever been in Ireland say the snakes were the Druids, the occultic priests of the Celtic people, and his reputation of ridding the island of the snakes is a cloaked way of saying he drove out the Pagans and converted Ireland to Christianity. He is remembered, as well, as the teacher who used the shamrock to explain the Trinity. 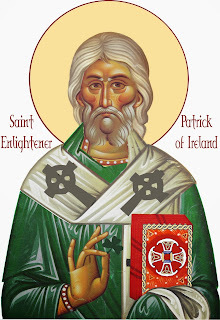 What is less well-known is that Patrick was an apostolic leader of enormous courage who moved in signs and wonders and demonstrated to the Irish, who were steeped in paganism, magic and occultism, that the power of Christ was greater. Patrick was enraptured by God, loved sacred Scripture, and engaged in continuous prayer. He regularly practiced the prophetic gift of hearing God in dreams and visions. Patrick recorded numerous dreams he regarded as personal messages from God. He held a deep sense of God's intimate involvement in his life. "I have known God as my authority, for He knows all things even before they are done," he wrote. "He would frequently forewarn me of many things by His divine response." For example, Patrick received his call to evangelize Ireland from a detailed vision not unlike the apostle Paul's at Troas, when a Macedonian man pleaded, "Help us!" "I had a vision in my dreams of a man who seemed to come from Ireland," Patrick wrote. “…and they cried out as with one voice, 'We appeal to you, holy servant boy, to come and walk among us.' I was deeply moved in heart and I could read no further, so I awoke." Much of Ireland was very dark and barbaric in the fifth century after Christ; a land of druids and pagans. A declaration of Christianity had not yet reached northern and western Ireland, so this is where Patrick began. The reverence the Irish held for these old deities was converted into hatred of demons. Predictably, Patrick faced the most opposition from the druids, who practiced magic, and were the advisors to the Irish kings. Stories abound of druids who "wished to kill holy Patrick." Patrick wrote, "Daily I expect murder, fraud or captivity, but I fear none of these things because of the promises of heaven. I have cast myself into the hands of God almighty Who rules everywhere." Seeing that the impious heathen were about to attack him, Patrick rose and said clearly and loudly, 'May God come forward to scatter His enemies, and may those who hate Him flee from His face.' By this disaster, caused by Patrick's curse in the king's presence because of the king's order, seven times seven men fell. … And the king, driven by fear, came and bent his knees before the holy man. [The next day], in a display of magic, a druid invoked demons and brought about a dark fog over the land. Patrick said to the druid, 'Cause the fog to disperse.' But he was unable to do it. Patrick prayed and gave his blessing, and suddenly the fog cleared and the sun shone. … And through the prayers of Patrick flames of fire consumed the druid. The king summoned his council and said, 'It is better for me to believe than to die.' And he believed, as did many others that day." Christ with me, Christ before me, Christ behind me, Christ in me, Christ beneath me, Christ above me, Christ on my right, Christ on my left, Christ in breadth, Christ in length, Christ in height, Christ in the heart of every man who thinks of me, Christ in the mouth of every man who speaks of me, Christ in every eye that sees me, Christ in every ear that hears me." The story goes that as the druids lay in hiding, ready to kill, they didn’t see Patrick and his men, but instead, a gentle doe followed by twenty fawns. St. Patrick and his men were saved. During his lifetime, (he lived into his 70’s) Patrick is attributed to having founded more than 300 churches and baptizing more than 120,000 people. He was primarily responsible for converting the Irish people to Christianity, and he became known as the Apostle to the Irish. While he evangelized Ireland, his influence eventually impacted all of Europe, and his day is celebrated March 17th in many places all over the world.